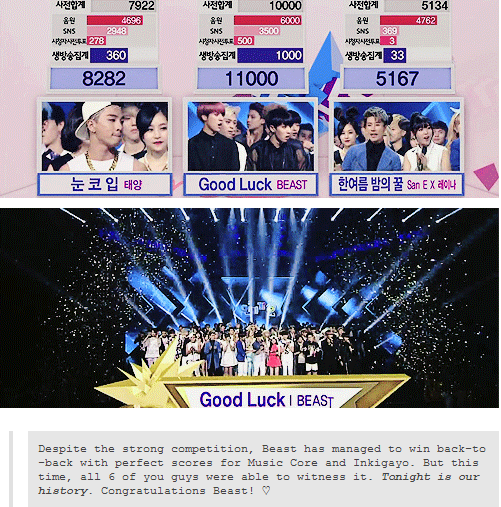 My favorite K-Pop group in all of K-Pop, B2ST / BEAST, won #1 on KBS’s Music Bank on its July 4’s episode. The day that they won also happens to be the same day that BEAST’s very own leader Yoon Doojoon’s was born! Doojoon was born on July 4, 1989 so I guess you can say that BEAST’s win on Music Bank is Doojoon’s birthday gift. Hehe. 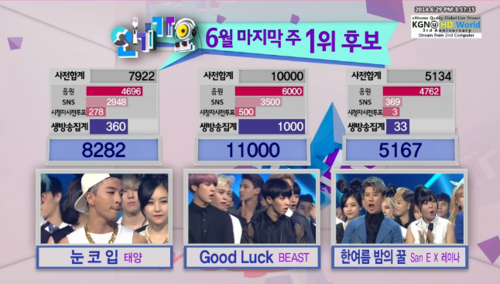 As you can see, these pictures provide proof that BEAST achieved a perfect score on last week’s episode of Inkigayo with 11,000 points. SLAYING EVERYONE SINCE 2009. (Love San E’s reaction too. Hahaha). 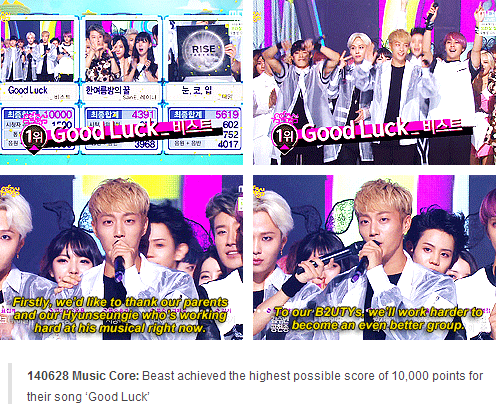 These two pictures here support BEAST’s win on Music Core where they achieved a maximum score of 10,000 points. 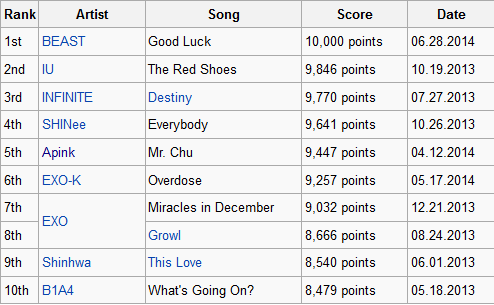 They are now ranked first among all the winners on Music Core with the most amount of points and the only group being able to have gotten a perfect score. (B2UTIES prepared this for BEAST at this year’s Dream Concert. OMGAHHHH. Look at how beautiful this is). Below are just a few more GIFs of the amazing grey ocean of an amazing fandom I am proud to say I am a part of. B2UTIES and B2ST forever! July 4th is also BEAST’s very own leader and oldest member Doojoon’s birthday so I just wanna take the time to celebrate his birthday and tell him how much I love him. In the beginning of BEAST’s debut, he had to miss out on some of BEAST’s promotions to promote BEAST by going on different shows. Although he was absent in some of BEAST’s activities at a time where it was the most crucial for BEAST because they had just debuted, were only a few months ago, and were trying to get their name out there, he missed promotional activities and schedules with BEAST just so he could promote their group by going on shows. Despite all of this, Doojoon was able to get BEAST’s name out there eventually with his great work ethics, respectful and humble personality, and funny variety skills. He’s now even one of the more well-known and popular members in the group. 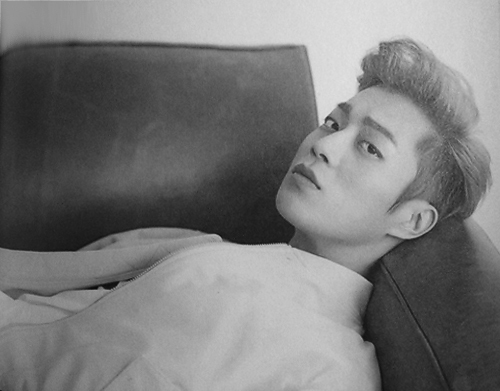 I have to admit that there was a point where I didn’t see Doojoon as a great leader or I questioned his leadership abilities, but I have come to realizing that Doojoon many of the times just doesn’t explicitly show his leadership skills, but the group members do depend and rely on him a lot. There are many instances where Doojoon cares for the members and treats them as if they’re his brothers from another mother. Last year when baby Dongwoon got his hand burnt by fire at a concert BEAST held last year, Doojoon was the first one to notice and care for him. I was so touched seeing that it made me realize that Doojoon is a great leader, but it’s just that he’s not the type to boast about his role or position in the group. Most of the time he likes to stay in the back and just watch over his members quietly, always putting them first and before him. I’m pretty sure it wasn’t easy having to lead a group with five other members who all were known as rejects and failures in the beginning of their debut. He had a lot weight on his shoulders and he probably felt really stressful and pressured to lead them well so that BEAST would not fail and become successful. Fast forward four years and look at where they are now. BEAST has now risen to become one of the most talented and well-known groups in K-Pop when they were mocked as the ‘Recycled Group’ back when they first debuted. My boys have come a long way and part of it was because of Doojoon’s leadership and hard work. (LOL AT HYUNSEUNG BEING THE ONLY NORMAL ONE). (ALL GIFs ARE NOT MINE. CREDIT TO WHOEVER THEY BELONG TOO).